Balloon Launch for August 25 cancelled due to weather. It will not be rescheduled. Shuttle service and FREE parking at the same 2 locations will also be offered on Friday from 3 pm - 10 pm. At this point, we do not foresee that any roads will be closed on Friday but please watch for signage if this should happen. Our premier event continues to be Metamora Country Days and Hot Air Balloon Festival. This popular family-friendly celebration draws thousands of visitors to our community during the second to the last weekend of every August. Revelers enjoy local food, music, art, a parade, crafts and activities as well as the launching over 20 hot air balloons on both Friday and Saturday nights, capped off with an extraordinary fireworks display on Saturday night. Would you like to participate? Click below for applications. The Metamora Chamber of Commerce is pleased to announce that we will be broadcasting the parade and events on the balloon field LIVE on the day of the event via Mixlr. Download the Mixlr app for FREE on your phone, select "listen" and then search for Metamora Chamber of Commerce. How do I arrange for a ride in a hot air balloon? Balloon rides are not offered through the Metamora Chamber of Commerce. The pilots typically book the rides well in advance. When do the balloons take off? The pilots and crew begin to arrive on the launch field around 5:00 pm. Then they arrange their baskets and chase vehicles on the field based on the predicted wind direction. At 6:15, a pilots meeting is called to hear the weather briefing and learn of the current and forecasted winds, speeds and directions. The pilots then discuss whether or not they feel the conditions are safe for a flight. If it’s a GO, everything happens very quickly. Are people allowed to get close to the balloons and look at them? YES this is what makes The Metamora Balloon Festival unique! The preparations are fun to watch. So, bring a picnic and enjoy watching the preparations. The preparations make for some great pictures and the pilots can answer your questions during this time. We do ask that you keep children close to you in order to make sure that the envelopes (that’s what the balloons are called) are not walked on and so that the children do not become trapped under the envelopes. While on the balloon field, please follow instructions from the pilots and event staff AT ALL TIMES! There are no bikes or scooters and no motorized vehicles allowed on the field and ABSOLUTELY NO SMOKING! What is a Hare and Hound Race? Every year, the participating balloon pilots compete in the Hare and Hound Race. The Hare and Hound Race begins by a pilot inflating his/her balloon (the Hare Balloon). The Hare flies out of the launch field, flies for 15 to 20 minutes, lands and places a large X on the ground. Upon a given signal, the remaining pilots (the Hound Balloons) inflate their colorful balloons, take off, fly toward the Hare Balloon and drop their numbered bean bags as close to the large X as possible. Cash prize money and bragging right awaits the first, second and third place pilots closest to the X. There are slightly different wind directions at different elevations. The skilled pilot maneuvers between these elevations to steer his/her balloon to the large X and the prize. On August 24th and 25th, we will see a mass exodus of balloons from the launch field knowing the pilots are jockeying for position to reach the coveted X and secure the win. Is there a way to hear announcements during the event? Yes. Download the Mixlr app on your phone, select “listen” and search for “Metamora Chamber of Commerce”. The Metamora Chamber of Commerce will be making announcements and provide information about hot air balloons, preparations in progress and launch time via Mixlr. The parade and all other Chamber related events will also be announced throughout the day via Mixlr. Is there a fee for any events? 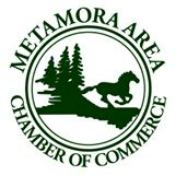 All events sponsored by the Metamora Chamber of Commerce are free. Some activities on the Lions field require a fee. There are various food options in town and on the balloon field. The Lions also have food options ranging from snacks to full meals. Can I be in the parade? Yes. Go HERE for a vendor application. I’d like to be a sponsor. How can I do that? There are several sponsorship opportunities – some even offer the opportunity to be in a drawing for a ride in one of the balloons! Go HERE for more information and a form or to pay on line. Is there a schedule for all of the events and activities? Once all events and times are confirmed, a schedule will be on this web site. The week before the event The County Press and Sherman Publications newspapers will have a full fold out section with all events listed as well. Where can I find up to date information about the event? Stay informed by liking the “Metamora Country Days & Hot Air Balloon Festival” Facebook page.